With the support and assistance of Williams Hybrid Power, BELA has been investigating the use of flywheel technology in the design of a mechanism for stabilizing power generated by the London Array, the worlds largest offshore wind farm of 175 turbines. Devices on a large enough scale become indistinguishable from landscapes, and the Energy Reservoir is an example of this: a constellation of architectural features, geological augmentations and topographic ornaments that harvests and smooths the fluctuating electrical supply and in many cases, reapplies electrical energy to a site on the Isle of Sheppey. Power levels and flywheel capacity is displayed in an elevated point cloud of laser light that ebbs and flows in the air like a mist over the landscape. The reservoir, functions like a landscape battery, inspired by the Dinorwigs Hydro Power Installation with its black start capability providing instant energy production via topographical advantage. 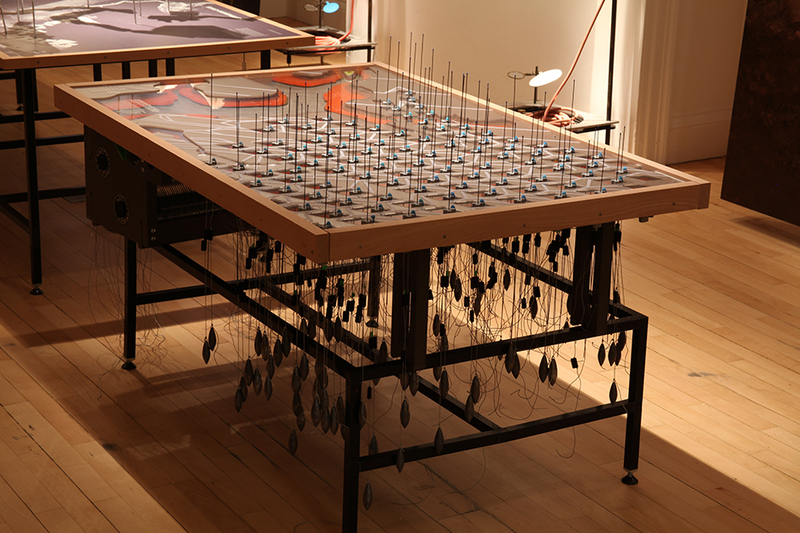 This speculative landscape-scale instrument currently exists only in model form.